Polybloggimous: Insufferably Pleased With Myself. 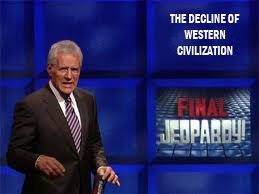 Anon GF and I like to watch Jeopardy and a few years ago, I developed a delightful quirk annoying habit. 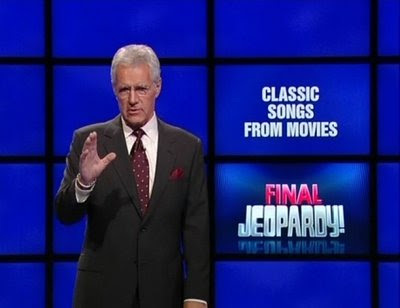 When Alex announces the category for Final Jeopardy, I holler out what I believe will be the answer. Anon GF loves has, so far refrained from throwing anything at me when I do this. Who is James Fenimore Cooper!!?! ...and I holler, "Who is Lillian Gish"? As usual, Anon GF rolls her eyes and ignores me. But I wasn't done yet. I said, "No...it's gonna be that woman who started United Artists with Douglas Fairbanks. Who was that? Oh, MARY PICKFORD!" Anon GF said, "If you ever get one of these right, there's gonna be no living with you." Fade back in from commercial and Alex reveals the clue -- ONE OF TWO WOMEN TO BE THE FIRST OWNERS OF MOVIE STUDIOS. And just for extra points, I knew that Lucille Ball was the other one! I really think Alex should be recruiting me for the show instead of making me take that damned test over and over again. I am so freaking happy for you!!! I have that same habit. When a Daily Double comes up, do you also shout, "Bet the whole wad!"? And then call them chicken when they never do? I cannot see James Fenimore Cooper's name without recalling that Mark Twain essay. That's sort of appropos of nothing but your single reference, I suppose, but there you are. I usually yell, "Nobody's gotten anything right in that category yet. Bet a dollar, you putz!" 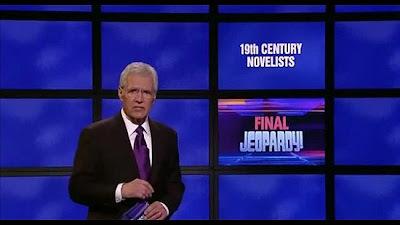 The "answer" in "19th Century Novelists" was, An author who was despised by Mark Twain.. This "answer" holds a Jeopardy record by having 76 acceptable correct "questions" to choose from. I prefer to tell the show, 'you're wrong'. They do this about once a week, although I grant you they correct most before the end of the show.